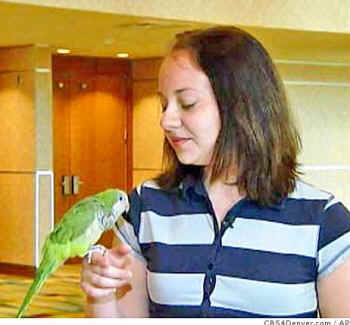 A Quaker parrot named Willie, residing in the home of guardian Megan Howard in Denver, Colorado, has been named a hero and awarded the Animal Lifesaver Award by the local Red Cross chapter. Megan was babysitting little Hanna Kuusk, to whom she had given breakfast, then stepped out of the room. Before long she heard Willie flapping his wings and screaming "Mama, baby!" repeatedly--obviously not "parroting" pre-learned phrases! Megan ran in to find that Hanna had choked and was already turning blue. Megan gave the child the Heimlich maneuver, which pulled her back, but did not hesitate to give full credit to Willie.